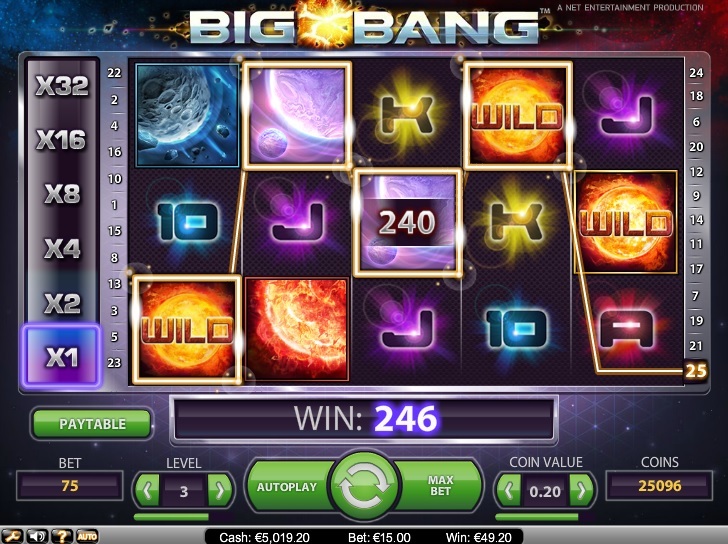 Net Entertainment’s (NetEnt) Big Bang slot was launched in 2014. Although the slot lacks all the usual bonus features such as free spins, there is an increasing multiplier of up to x32 that can help players win large payouts. Big Bang slot comes with 25 fixed paylines, which means that players will have to play them all. The coin values range from $0.01 to $0.50 and the minimum bet is $0.25. Players can then increase their bets in increments of $0.25 and bet a maximum of $50.00, which makes Big Bang one of the most affordable slots in the NetEnt portfolio. After placing their bets, players should click on the Spin button to set the reels spinning. If a winning combination of symbols is displayed on the reels at the end of one spin, players will get paid according to the game’s pay table. The slot’s Autoplay feature enables players to set the game to play automatically while they get busy with something else. Big Bang, as its title suggests, is based on the science theme. The reels are set in outer space and players are given the unique opportunity to travel in space and come across colorful planets. In other words, spinning the reels of Big Bang is like learning science in the most colorful way possible. The reels feature symbols of multi-colored planets and high-value cards. The ambience music, sound effects, graphics, and animations are all in keeping with the slot’s theme, giving players the most entertaining slot gaming experience they have ever had. The hottest features of Big Bang are its progressive multiplier and wild symbol. This progressive multiplier feature can actually multiply players’ winnings by x32. Players should keep an eye on a multiplier meter that is located to the left of the reels. Each paid game begins with a multiplier value of x1. If players spin a winning combination, the multiplier value increases to x2. The multiplier keeps increasing to x4, x8, x16, and x32 with each win. The maximum multiplier value that players can get is x32. The Sun symbol serves as the wild, substituting for all the other symbols and helping players win payouts. Initially, the slot may appear bland—there is no scatter symbol, bonus symbol, free spins, and bonus game on the second screen. On second thoughts, Big Bang is one of the most exciting, innovative, and lucrative slots in the NetEnt portfolio, enabling players to win up to x32 their winnings. Big Bang is available for fun as well as real money at any online casino that runs on the NetEnt software platform. Since the slot turned out to be very popular, NetEnt launched a mobile version, which players can enjoy their smartphones and tablets.